I’ve never seen a hotel quite like Arolithos Traditional Cretan Village before. I only stayed there because I took the gamble that Hotwire offers, and I thought that I’d lost the gamble. I’m still not sure one way or the other. You can specify a geographic area on a map as well as how many stars. I chose Heraklion and four stars, and then chose the cheapest of the hotels shown. All you get is some general information: whether it has a pool or not and that sort of thing. I’ve used Hotwire before, particularly when I was hanging around Seoul, South Korea, getting medical care. In Seoul, I could choose a part of town on the Hotwire map, and I liked each hotel I booked this way. In this case, however, the geographical area indicated on Hotwire’s map stretched from the airport in the east to past the city limits in the west. Hoping for something near the airport, since I was leaving the next day, I took the gamble. I paid €27.79, including fees. 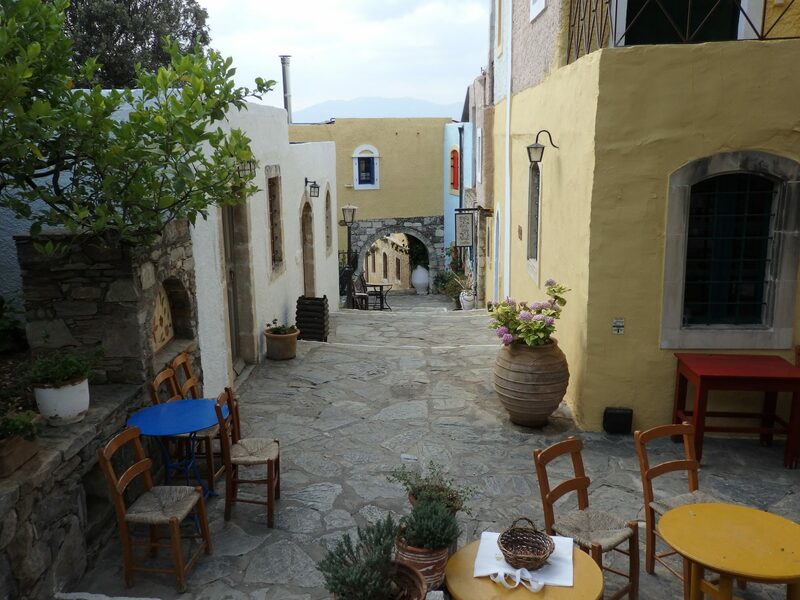 Once I had paid, I was disappointed to find out that I had booked Arolithos Traditional Cretan Village, far outside Heraklion, the opposite side from the airport. I knew the hotel would be okay, going by its description and its four stars, but feared the cost of the taxi to the airport (which turned out to be €30, doubling the price I had paid for the hotel). What makes this hotel so unusual is that it is actually a replica, built in the 1980’s, of an entire traditional Cretan village. Of course, I can’t vouch for its authenticity. It might be the Disney version of a Cretan village, for all I know. I had to keep pushing the thought away that it was all fake. When I did that, and just took it for what it was, I saw an absolutely lovely environment. Winding streets between picturesque houses (i.e. 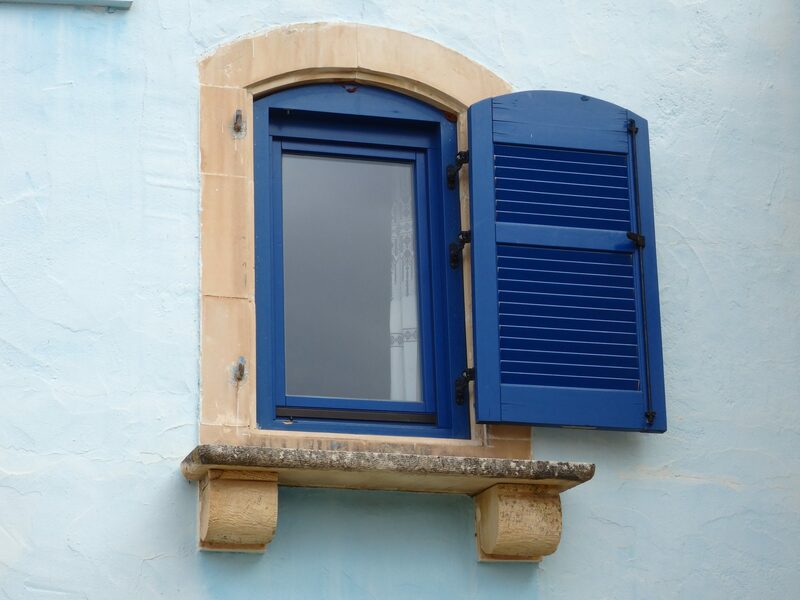 hotel rooms) with brightly painted doors and windows, flowering plants spilling over walls, wider places where wooden chairs and tables allow visitors to watch the world go by … This is the stuff of any traveler’s off-the-beaten-path dream. 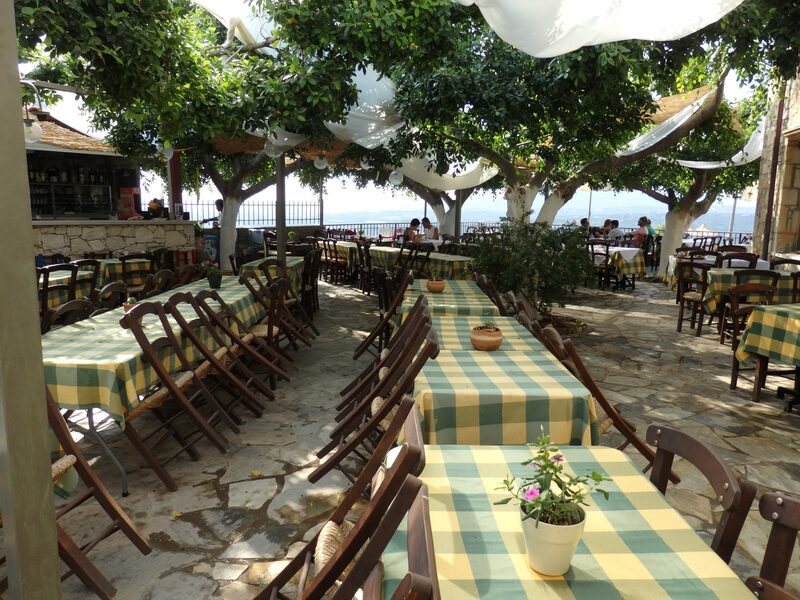 The breakfast room was in the taverna, though most of the taverna was actually outside, on another large patio, complete with lovely early-morning views over the hills in the distance. It also overlooked the pool, which I didn’t try out but certainly looked pleasant. There were even various shops, including a gift shop selling mosaics, though most were not open early in the morning when I explored. I did stumble upon the Museum of Rural History and Popular Art, though: one of those odd, local, quirky museums I love. After paying a small entrance fee, I entered a large room lined with a number of random collections, as any small town museum should have: a collection of guns, for example, and one of needlework, and a variety of other items like a large loom. A large side room depicts a local home, though it isn’t divided into separate rooms. One corner shows the furnishings of a bedroom, one shows a kitchen, and so on. Downstairs is where it gets pretty kitschy. 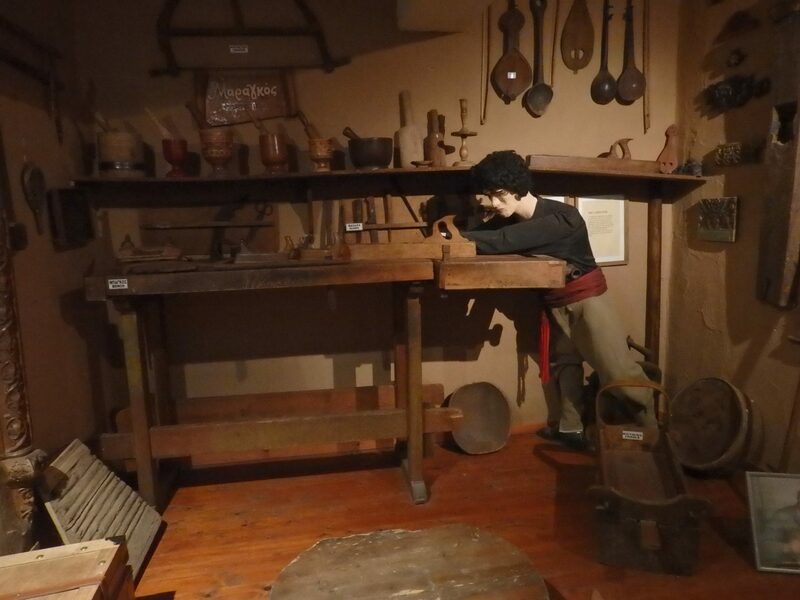 Illustrating different vocations like basket-weaving and carpentry, some of the workshop areas include a mannequin representing the craftsman. These are old, decrepit mannequins, with ill-fitting, far-too-luxuriant wigs. It just made me laugh. It looks as if this “carpenter” has passed out on the job. 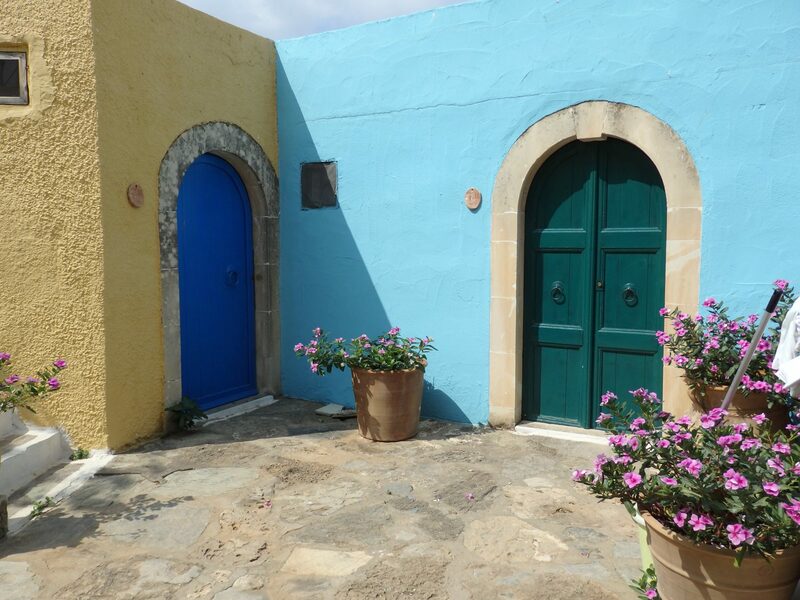 You might be wondering about the rooms at Arolithos Traditional Cretan Village. 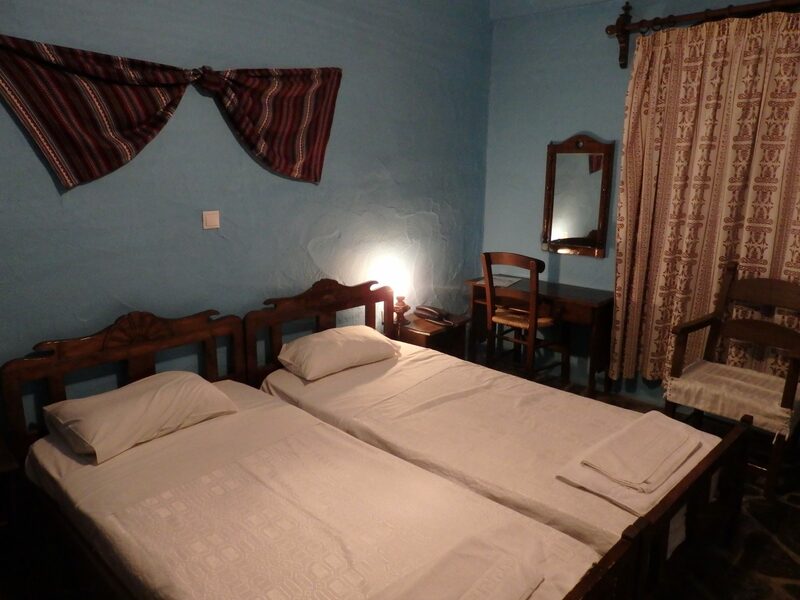 To continue the rustic theme, the rooms are indeed on the basic side: not what I’d call four stars. The bed was comfortable enough and the room was clean, but the bare stone floor of the room and the bare stone walls and fluorescent light of the bathroom didn’t look charming. They just looked unfinished. I don’t know if the ponderous furniture actually was dusty or if the room just exuded a dusty atmosphere. On the other hand, an air-conditioning unit high on the wall worked well, and a small balcony overlooking my picturesque but fake street was a pleasant place to sit with a book in the cool of the morning. Would I recommend Arolithos? For a wedding, a reunion, or other large-group gathering, it would be perfect. In other words, for any vacation where the point is to see each other, rather than to see Crete. If you mean to see the island or spend time on the beach, it’s probably not the best choice, especially without a rental car. On my next trip to Crete, I’ll rent a car and do some driving on the back roads. I’d like to see if Arolithos hotel’s view of traditional Cretan life actually matches anything still in existence, or whether the whole thing represents nothing more than a long-gone idealized view. Have you been to Crete for a longer visit than mine? Do these pictures resemble anything you saw “in real life”? Have you used Hotwire? How did it work out for you? Very odd little place…to build in the 1980’s?? Oh, and when you said, “The American groom married a local Greek woman.”, you just know I thought immediately of FATCA? Haha! Don’t know if they’ll stay in Crete or the US! Yes, very odd. Though it’s a lot better than a lot of 80’s architecture! 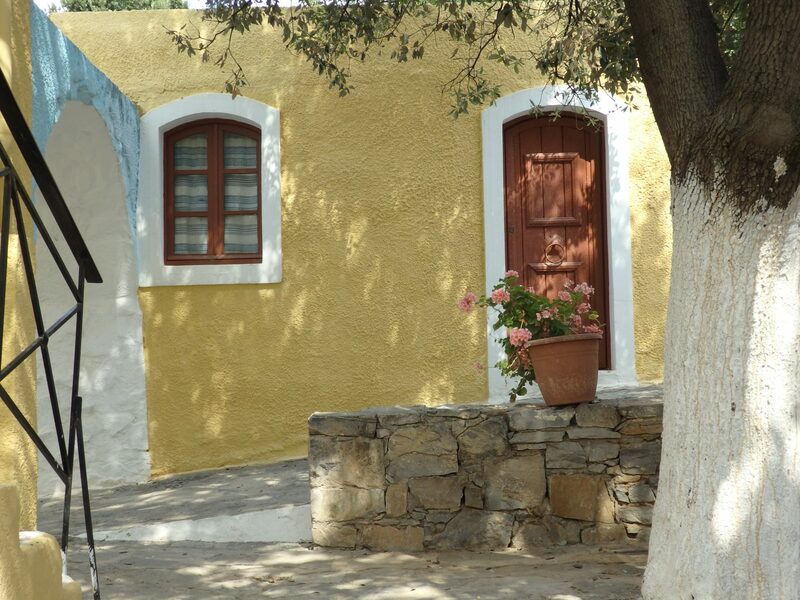 So many travel accommodations (especially budget) are gambles which either enhance or detract from the experience but, except for the location, the Arolithos Traditional Cretan Village looks charming. It would be a lovely place for a quiet or romantic stay but I can definitely see why a car to roam around nearby villages and explore the countryside might be useful! By way of contrast, I’m in Stockholm now, in a hotel I booked through Hotwire again. It’s a four star, though it’s high-end four star, I’d say. I paid about 55 euros per night, which is very cheap for Stockholm! Excellent location too!